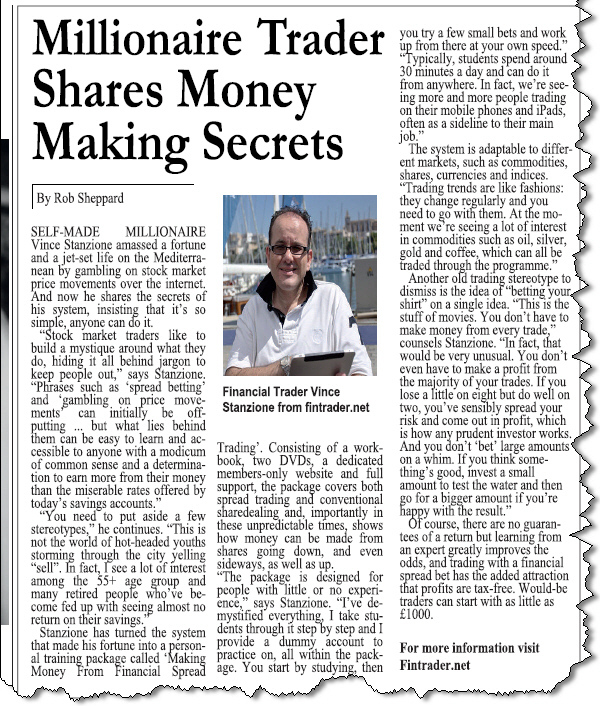 Vince Stanzione and Making Money From Financial Spread Trading featured in today’s Independent Newspaper. Clipping for The Independent Newspaper Business Franchise Section 26th July 2011 – Page 32. SELF-MADE MILLIONAIRE Vince Stanzione amassed a fortune and a jet-set life on the Mediterranean by gambling on stock market price movements over the internet. And now he shares the secrets of his system, insisting that it’s so simple, anyone can do it. Trading’. Consisting of a workbook, two DVDs, a dedicated members-only website and full support, the package covers both spread trading and conventional sharedealing and, importantly in these unpredictable times, shows how money can be made from shares going down, and even sideways, as well as up. Of course, there are no guarantees of a return but learning from an expert greatly improves the odds, and trading with a financial spread bet has the added attraction that profits are tax-free. Would-be traders can start with as little as £1000. This entry was posted in Uncategorized and tagged does vinces stanzione course work?, financial spread betting, how to make money trading shares, make money with commodities, millionaire trader, Retired Make Money, Spread Betting for Beginners, spread betting on gold, trade2win, vince stanzione, vince stanzione blog, vince stanzione forum, vince stanzione press cuttings, why do I keep lossing money trading. Bookmark the permalink.